Mitchell Memorial Library at Mississippi State University opened a display of typewriters used by famous authors today. Steve Soboroff is sharing some of his collection with places along the Southern Literacy Trail. The display opened today and I took a few minutes to visit. Included in the exhibit at MSU include typewriters used by Ray Bradbury, Ernest Hemmingway, Tom Hanks, Truman Capote, and others. 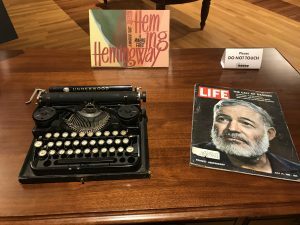 I found especially curious that I saw the typewriter used by Ernest Hemingway, author of For Whom the Bell Tolls, the favorite book of Senator John McCain, on the day that Senator McCain’s lay in state in the Capitol of the United States. 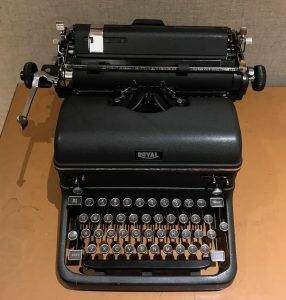 Typewriter used by Ernest Hemingway. -1970s, I read Fahrenheit 451 which I think just may have been the beginning of my love of books. Even then, I had always read but books were consumables. The library served my needs well. If I bought a book, I’d save a few bucks and opt for paperback. Today, I read many e-books but I also own hardback copies of most of them. My house would definitely be one in which the fire department would arrive to make a fire. I also read George Orwell’s 1984 around the same time and it similarly had an impact on me. In today’s world where politicians scream “fake news”, tell outright lies (despite photographs of, I don’t know, inauguration speeches), and de-value intellectualism and reading, I am reminded of the book often. Then there was John Lennon’s typewriter. 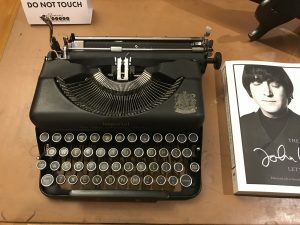 I am not a big Lennon fan—my tastes run more towards Paul McCartney—but I enjoyed seeing his typewriter on which he wrote his book. I found it funny that he says he wrote short essays because he typed slowly using one finger. If you are near Mississippi State University, I recommend you stop by and visit the display. It is in the John Grisham Room which is worth spending some time perusing as well. And well, since you are there, you might well go up a few more floors and see the outstanding U. S. Grant PresidentialLibrary and the collection of Lincolniana.